This right facing ¾ length portrait miniature shows Eleanor Elizabeth ‘Nelly’ Stephen in evening dress, at about 20 years of age. She is posed seated on an upholstered arm chair in a studio interior with a prop table to one side, covered in a green baize cloth and holding [writing] materials. Compared to daywear, Victorian evening dress was very revealing with low cut bodices intended to show the neck, shoulders and upper bosom, or décolletage, and shorter sleeve lengths exposing the arms. Eleanor wears an elaborate, if somewhat austere, ball gown in a black and white colour palette which may be indicative of half-mourning – given the size of the extended Stephen’s clan, it would have been rare for members of the family not to have been in mourning periodically. The silk taffeta dress has a low cut décolletage, trimmed around the wide neckline with a band of ruching, and a fitted bodice ornamented with an ‘eschelle’, or ladder, of ribbon bows above a pointed waist, the fullness of the skirt enhanced by triple-tiered flounces with scalloped edges. Her sheer white chemise is visible at the neckline and a pair of layered, gauzy undersleeves sit below short puffed sleeves trimmed with large, square handkerchief-like oversleeves, or ‘jockeys’. She wears her centre-parted light brown hair in the fashionable ‘bandeau’ style, with smooth sections wrapped over her ears and pinned behind, the remainder rolled and tucked into a hair net, or ‘snood’, of black [chenille]. She also wears a gold locket, suspended on a black ribbon, and a bracelet of wrought gold, perhaps one of a pair as her other wrist is obscured by the volume of her skirt. 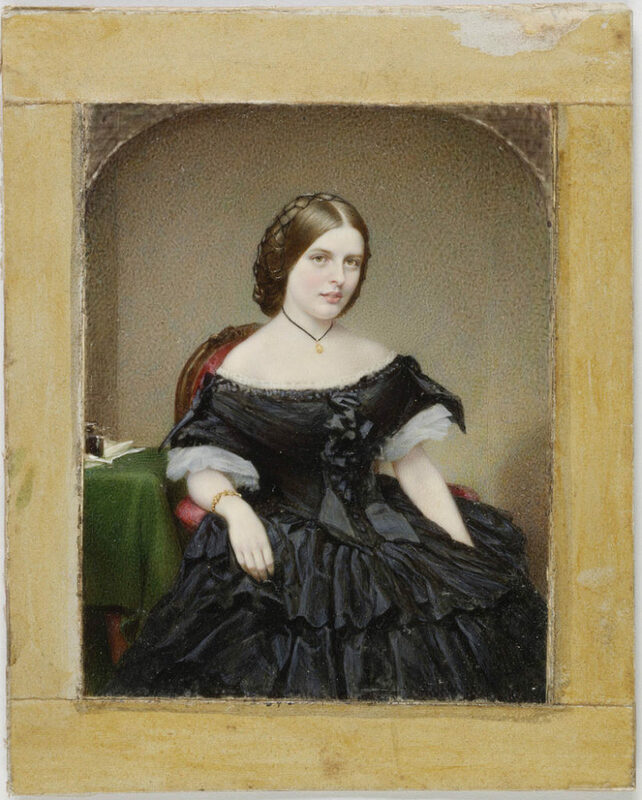 This miniature portrait may have been commissioned to mark Nelly’s 20th birthday on 19 August 1859. The Stephens are known to have frequented the George Street studio of Edwin Dalton, most expensive photographer in Sydney at the time and regarded by Lady Stephen as the best. Dalton was also known to be a miniaturist. On her last visit to the Dalton studio, Nelly also posed for two hand-coloured ambrotype portraits of varied size and casing, which show the subject in the same pose and wearing the same outfit as recorded in this miniature painting. It seems likely that all three likenesses were created in the same session or in sequence – it seems unlikely that the ambrotypes are the basis for the miniature, as the detail recorded in the painting is far superior to that of the photographs, but the photographs may have been used by the artist as a memory aid. Given the circumstances of Eleanor’s untimely death just one year later, all three portraits were subsequently transformed into treasured ‘memento mori’. Eleanor Elizabeth Stephen (1839-1861) was the eldest daughter of Sir Alfred Stephen, third Chief Justice of NSW (1844-1873), and his second wife Lady Eleanor Stephen, nee Bedford (1810–1886), who was mother to a large family of eight children of her own and seven stepchildren. While her husband was away in England for a year, Lady Stephen suffered the double deaths on the same day of her first born child and her own mother. The events leading up to Nelly’s sudden death on the 7 February 1861 are described in some detail in Lady Stephen’s diary (MLMSS 777/3). Though her mother does not specifically define the fever as typhoid, Nelly’s fatal bout of illness is documented as lasting from 26 January to 7 February 1861. Initially, her sisters were allowed to sit with her but, by Sunday 3 February, Lady Stephen had banned them from the sick room for fear of infection. As Nelly’s weakness and delirium intensified to the point of danger, the doctors considered removing her hair to lower her head temperature – an alarming sign to the family of her imminent death. Nelly’s hair was cut off on 5 February and on 6 February the doctors ‘seemed…to think there was hope for recovery’. But by the final morning they ‘merely looked on…saying little’ as about a dozen members of the family assembled in the sick room while prayers were read; 30 minutes later Nelly quietly ceased breathing. Mrs Bedford, on hearing of the death of her grand-daughter, succumbed to ‘one of her spasms of pain’ and died within the hour. Afterwards, Lady Stephen recorded that the family took their last looks at the two corpses ’again and again’. See: Birth notice: 19 August 1839; Obituary, Sydney Morning Herald, 19 February 1861, p 7. This miniature appears to be modelled on an ambrotype at MIN 202.